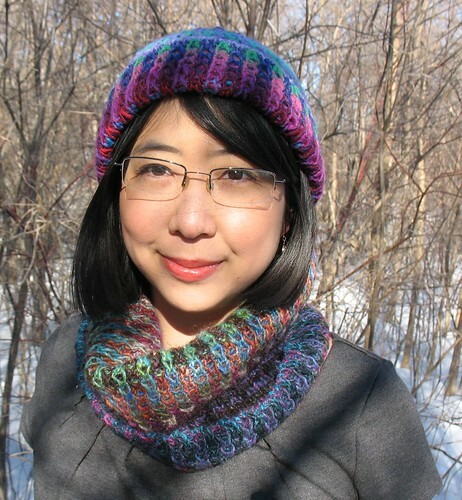 (this link goes to the scarf page in Ravelry, but the PDF you will download includes the instructions for all three accessories; I had to set it up that way in Ravelry, but there is no need to purchase all three separately). 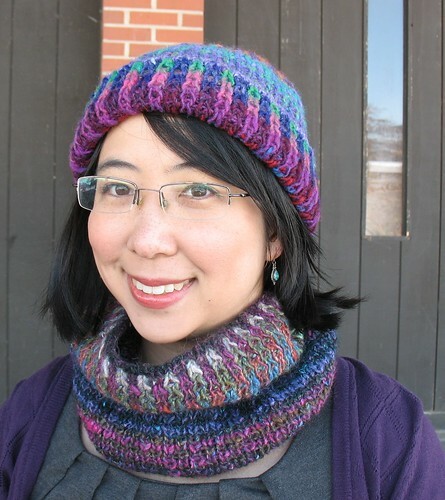 This pattern is incredibly easy—nothing more than knits, purls, and slipped stitches, with just one color used per row—but the end result will make even experienced knitters do a double-take: like magic, vertical stripes appear on one side of the fabric, and horizontal stripes on the other. 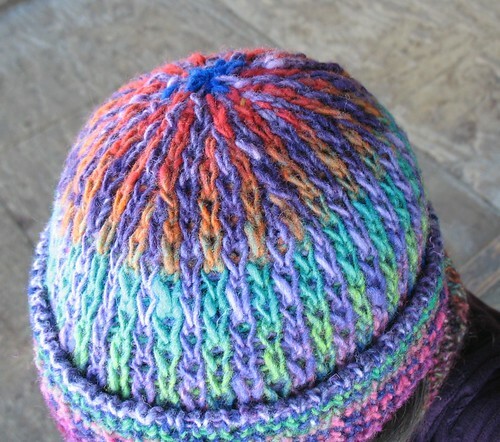 The effects are accentuated by the use of two contrasting self-striping yarns. 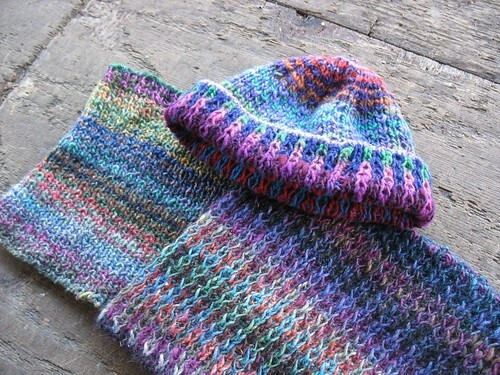 The pattern includes instructions for a scarf, cowl, and hat: the scarf and cowl are suitable for beginners, but the hat decreases are worked over a large number of stitches and require more concentration and pattern-reading skills, and may be more suitable for an intermediate-level knitter. 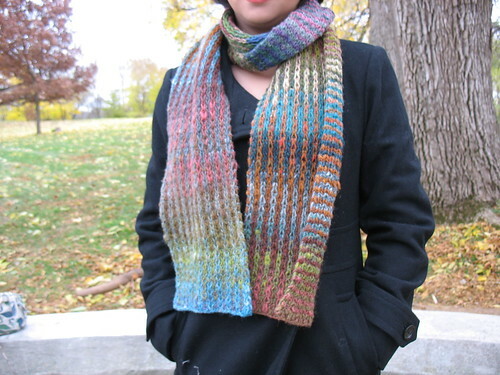 The samples are all worked in Noro yarns, which are famous for their self-striping properties and fabulous colors. There are many other self-striping yarns on the market with similar fiber content and price range that could be substituted, like Berroco Geode or Jasper, Wisdom Yarns Poems, or Crystal Palace Taos. 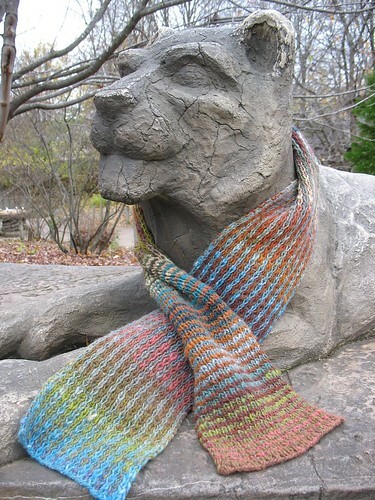 The pattern includes a brief reference guide to some other worsted weight, self-striping yarns that could be substituted, and reasons you might prefer each of them to Noro. For the best results, I recommend choosing contrasting colorways, as much as possible—one with primarily warm colors, one with primarily cool colors; or a bright/neutral pair, or a pale/dark pair. The pattern would also be very effective with two contrasting solid colors, or a solid color paired with a variegated/self-striping yarn. Recommended accompanying reading: Dava Sobel’s excellent book Longitude tells the fascinating story of the 17th-century competition for clockmakers to build timepieces accurate enough to allow sailors to navigate accurately when sailing great distances east or west—these timepieces were needed because longitude had to be calculated using the difference between local time onboard the ship and a clock showing the time in a known location, say, in the sailors’ home port. With today’s technology, this could easily be done with a couple of five-dollar wristwatches, but at the time, prizes worth millions of dollars were offered to the clockmaker skilled enough to manage the feat. 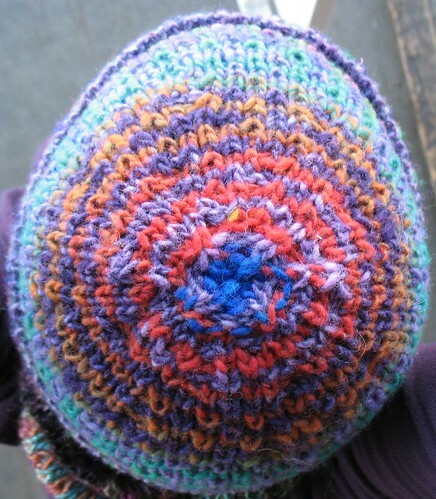 To resize hat, adjust gauge by going up or down a needle size. If choosing to work tubular CO and BO, depending on which method you use, you may need waste yarn for the tubular CO and an extra circular needle for the tubular BO. I also recommend using a needle one or two sizes smaller for the tubular CO.
See the blog post for more photos, if for some reason you haven’t had enough Noro stripes in your diet today.